Beveled edges meet the standards set in the Americans with Disabilities Act. Fully launderable mat that performs great as an anti-fatigue mat with the added qualities of a flow-through mat in wet or dry environments. Constructed of 100% Nitrile Rubber for superior grease and oil resistance. 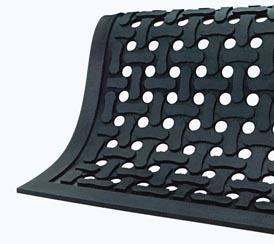 Anti-microbial treated to guard against degradation from micro-organisms and minimizes mats being a source of odors. Provides excellent anti-fatigue properties for added employee comfort and improved ergonomics. 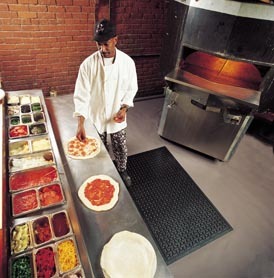 ComfortFlow mats are ideal for kitchens and food processing areas, behind bars, walk-in freezers, work stations, heavy industrial anti-fatigue mats, machine shops, locker rooms areas and more! Anti-static for use around sensitive electronic equipment. ComfortFlow mats are certified slip resistant by the National Floor Safety Institute.